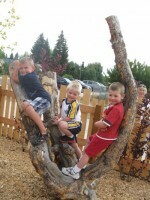 Pinedale Children’s Learning Center is the 100th Nature Explore Classroom certified by the Nature Explore program, a collaborative project of the Arbor Day Foundation and Dimensions Educational Research Foundation. These classrooms, which are being developed across the country, offer children positive experiences with nature on a daily basis. While each classroom is unique in size, setting and structure, all bring a sense of wonder to children’s lives. 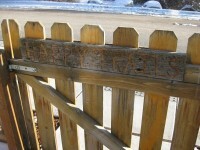 Pinedale, Wyoming is a small rural town in western Wyoming, 90 miles south of Yellowstone National Park. At 7100 feet, it sits at the base of the majestic Wind River Range. It is here that you will find a little school called Children’s Learning Center, which has been serving young children and their families for over thirty years. With 80% of the county being public land, outdoor activities such as camping, skiing, hiking and boating are common. It only makes sense that this school would build an outdoor space that reflects the natural beauty of the area in which they live, where the children have opportunities to participate in activities that reflect the local lifestyle. 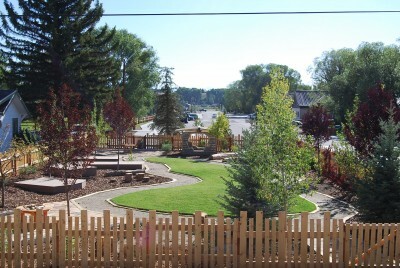 The yard, built during the summer of 2011, is filled with 25 native trees, numerous bushes and varieties of wildflowers. Everything in the yard is made of natural materials including a homestead cabin with a sod roof which covers the sand digging area. A garden party/dedication was held in early September to celebrate the space opening and to recognize the donors and committee members who participated in this project. 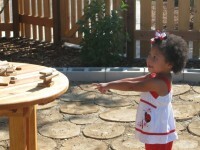 Since the dedication in early September, the children have been involved in many types of activities in the space. 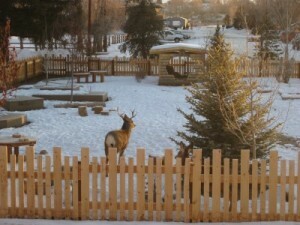 Moose have wandered by to visit and to check out the new plantings in the yard. A local ranch family brought a horse by for the children to ride. In the fall, children and families participated in a camping day complete with tents, sleeping bags, fishing poles and everything needed for a day of camping. A stocked fishing pond, located in the park across from the school, allowed for a real fishing trip while roasting marshmallows was a favorite activity in the Gathering Area which the children named “The Campfire”. Now that the snow has arrived the children are experimenting with snow and of course, they are bringing out the snowshoes and skis. A heartfelt thank you goes to BP, Wyoming Community Foundation/Sublette Community Foundation, Daniels Fund, Ultra, QEP, Shell, EnCana and the Charles D. Trover Family Foundation.